List of all the Trailers shown in the Video Game Awards ! The reason I wait for the Video Game Awards is mainly for the trailers. I sat down with a happy face to watch the whole show from Spike TV but thanks to them, I was not able to do so due to my ‘location’. I wonder what secrets were being revealed ? Lucky for those who had the opportunity to watch the trailers live! The Elder Scrolls V: Skyrim snatched three awards including the Game of the Year! The other two titles they won were the Best RPG and Bethesda Studios (developer of Skyrim) winning the Studio of the Year. Portal 2 won 5 awards under the categories of Best PC Game, Best Multiplayer Game, Best Performance By A Human Male, Best Performance By A Human Female and Best DLC (downloadable content). Well, as a PC gamer, I wouldn’t have voted for it to be the ‘best’ PC game. We know the great debate that occurred before the release of both Modern Warfare 3 and Battlefield 3. Fans of MW3 will now get the chance to boast around as they won the Best Shooter Award. Bad luck Battlefield! Anyway, now for the huge list of trailers. 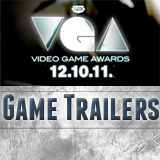 Thanks to Game Trailers for uploading all the trailers that were featured in this award show. Updates about the games will be given in the future posts! Enjoy the videos! How awesome is the HDD media player? Trailers are ussually at its so as to attract viewers I just hope the the games as well!! Great collection of trailers. I really have my fingers crossed on this new Spider-man game coming out. The preview looks great but I would like to see more game play video before I rush out and buy it. These games all look good. What I am looking forward to is the Last of Us. That looks like a killer survival game. The trailer blew me away! I am pretty sure the game would be awesome too! Some of these games are going to be EPIC, simple as that!! Totally agree with you. Out of all the trailers, Transformers and Last of Us was the best. By seeing the trailer of MGS, I can deduce that it is a mixture of Ninja Gaiden and Devil May Cry. Well, not a MGS fan but from what I know, it is supposed to be a stealth game ! Lets wait and see!